In short, by following numerous tutorials I have managed to add hard points and tangents to my ship, convert it to mesh from XSI and somewhat set up the entities, manifests and the whole mod folder so that the ship should appear as a titan for Psi-rebels. Guessing just from what I can see, it's a problem related to the mesh and directX failing to handle it. But that's as far as my understanding goes. Otherwise I have absolutely no idea what this is and why it's happening. I have found similar errors being discussed around here, but none of them is really the same as this one and their solutions don't seem to apply for me. I believe there aren't any mistakes in my edits of the entity and manifest files, but again I only have the basic understanding of how they work, and the syntax checking and validation tools I found on these forums seem to no longer exist. I don't know whether there is any problem with the mesh itself, I don't recall the XSI converter giving me any errors and beyond that I don't know what could be wrong. I am deeply hoping that anyone of you who actually understand what I'm doing (cause I don't think I actually do) will be willing to help me out. Please feel free to look through them and slap all the mistakes you find in my face. - Preferably along with advice on how to fix them. I thank you in advance for help. I really appreciate it. I'm not an expert on this, but you may have hit the size limit. The largest uncompressed mesh I use is around 12 MB, yours in 20. I know there is a limit of some sort but I couldn't tell you exactly what it is. Double check the XSI converter didn't give any errors. Things like using anything but triangles causes issues in Sins for example. Firstly, I like your ship model. It's definitely unique. That said, your issue is likely exceeding the # of triangles allowed. Your model is ~60k triangles. I think one of the old knowledgable modelers put the upper limit around ~50k. If you have a tool for baking detail you could probably reduce that model quite a bit taking the raised detail along the hull and baking that detail onto the texture of a lower poly game version. Oh, yeah you're both right. I totally forgot to watch the number of polygons. I modeled the ship using quads, which showed comfortable 30k on the counter, and I didn't realize that number is going to double when I triangulate it... Oh well. I'll go and do some reducing then, hopefully it'll work afterwards. Thanks for pointing that out. Hope you post a picture of it when you get it in game. I took a quick look at the texture but didn't thrown it in a modeling program. Well, the good news is that I did get it into the game. (Kudos to you, guys) Advent rebels can now pick from two titans and it doesn't crash the game, which is cool. It even flies facing the correct way forward and shoots from the right points. That's one success. 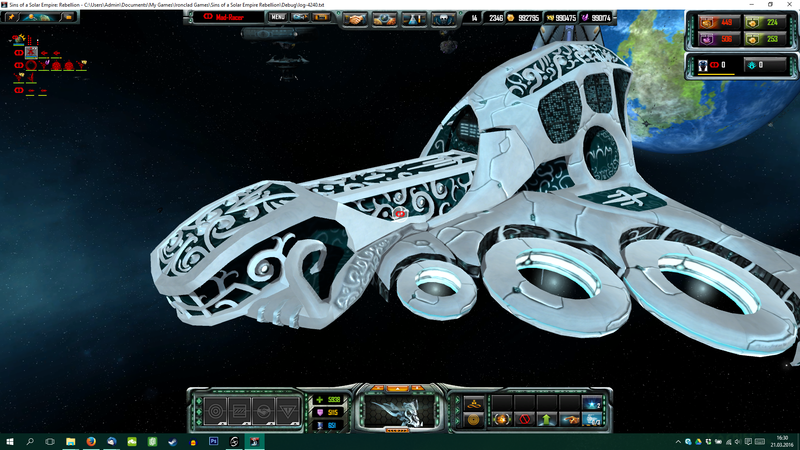 The bad news is that the tangents/shading are totally broken, making the ship a bit of a pain to look at. Strangely, despite using a cubical projection and everything looking right in Softimage, in game the ship is shaded correctly only when facing the sun by its right side. From any other direction the shading is all over the place. So I'm reading the wiki and experimenting with different projections. I'll post a picture if I won't manage to fix it on my own.. The XSI is not being too cooperative either, sometimes I get an error when trying to assign tangents to a texture projection - compatibility mode fixed that, but only temporarily it seems. I've not yet run out of ideas, so I'll be messing with that for a bit now. I'll update the folder above as soon as I get to it, so that you can take a look too and perhaps point out some obvious things I'm missing again. I did my homework and suddenly lot of things make sense. Apparently I'm having tangent issues 'because' I've used cubical projection. My model has mirrored UVs to save up texture space; tangents and Sins don't like that apparently. I'll have to try planar map and see if it looks better. Now that I know how to do the tangents properly, the XSI mod tool has decided to not work in my favor .. or .. at all. I suppose it's because it's been unsupported for so long that it's simply incompatible with newer systems, even in compatibility mode. The only exception is when I create a blank new scene, put the model in, create second texture and tangents, only then I can pick the second projection without error. But only once. Touching the tangent generator but one extra time makes xsi go invalid call and there is no way back from the loop. I tried reinstalling XSI, also tried the different version, but apparently the problem is the same in the old script, so the the error seems to remain identical through all mod tool releases I put into my computer. For now I'm gonna try installing and running XSI in a virtual machine with WinXP, to see if that fixes the problem. EDIT: Virtual machine didn't help fixing my problems with XSI, but I managed to somewhat resolve the tangent problems anyway - not sure how, but I eventually got the projections set up so the ship is decently shaded. It's far from perfect, still has issues, but it's acceptable now. I know that Softimage 2014 and above work for Sins. For one reason or another, it seems that Softimage 2013 (iirc I know a modeler that uses that one) suddenly reversed the post-7.5 trend and it's xsi exports work with ConvertXSI. Perhaps using a newer Softimage will work more easily. Yeah I totally agree. Though I'll consider the ship itself finished for now and will focus on doing other parts of the mod, such as shield mesh, abilities, and button pictures. Afterwards I'll see if I can further improve the tangents in newer Softimage. Well, my time is totally limited, but you can send me your XSI and whatever original format you were importing from and I can have a look at your tangent problem. Probably next sunday or so.